Sold out month before the show. Setlist mirrors previous performance to the smallest details. First, I must say it was a damn good performance -- as always. The support bands were rather good. Scoda Blush sounded a bit like Radiohead, but I can't say much about them, 'cause I've just heard their last two songs (it took a long time to get in, due to the fact that the venue was sold out a month before). Think About Mutation were quite good, but the audience was a bit too calm. In other reviews I read that the crowd went crazy when they played. Well, I blame it on the fact that they come from Leipzig and in the east of Germany they're well known and loved but in the west they're still unknown. I've seen them in Glauchau, and I think they improved their set since then. I read in an interview that Andrew chose them because he liked them at the Glauchau festival. But now to the Highlight everybody was waiting for. As the new intro started the crowd suddenly woke up and celebrated the Sisters. I heard the new intro for the first time and it sounded quite good -- although I still think Afterhours medley-ed into Kiss the Carpet as I heard it in Essen'93 is the best Sisters intro. But First and Last and Always is also a good opener. I'm beginning to like the new versions of the old songs. And the new songs are really good, too. With the exception of Suzanne which is a bit too boring and simple musically, and wears off after a few minutes. The setlist was very good, nearly all favorites with the exception of Alice. I don't understand why he doesn't play this classic anthem anymore. And I missed Confide in Me or Blood Money (the only Hussey written song played live for years). Von's outfit looked elegant. The St.Pauli shirt at the encores was quite funny. I recognized that the whole gig was filmed. There was a camera high over the mixing desk and a second cameraman filmed the show and the audience in the space between stage and audience. I bought the new fanzine GPS and found it quite good. It certainly not reaches the standard of UTR, but it's a good info source for all those who don't have a chance surfing the Net. "Das Glasperlenspiel" is a name of a book by H.Hesse. BTW, who was this guy standing on the shoulder of another for nearly ten minutes? I guess it was some of you English people? I've also heard a lot of Dutch speaking people. All in all it was a very satisfying event, as were all the Sisters gigs I've ever seen. I hope to see them again in the near future. And I'm waiting for the new album! My wife and me have been at the Stahlwerk in Duesseldorf and I just wanted to share my enthusiasm with everyone who's interested. My last concert was at the Helter-Skelter Festival in Ochtrup. The Stahlwerk Gig was simply excellent! Eldritch looked very healthy and vital and his energy and pure enthusiasm that one could feel when he was on stage were very impressing. He just gave it all! Even the very voice-stressing songs like Temple of Love were sung better than ever. The song-list was a mixture of classics (like Anaconda in the powerfully modified live-version), and some new songs which were unknown to most of the audience. The band gave two encores including a very nice version of Jolene. The concert made clear again, that Eldritch is far away from retirement age (if he ever will) and that the Sisters will be alive for a long, long time. I'm happily looking forward for the next concerts and a new album. 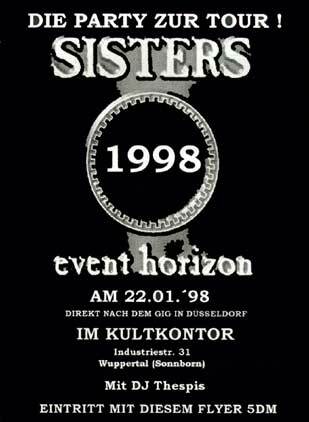 I have been to the gig in Duesseldorf and must say that I really enjoyed the Sisters performance that evening, though the concert in Glauchau last year was still a bit better in my opinion (probably some of you have been there, too, and are able to judge). I liked the setlist in Duesseldorf and was very happy they did not spare out "Comfortably Numb/SKOS", which still is the highlight of every show in my opinion! I have to say that I liked the new songs, too. I remembered "War on Drugs" from last year, but must say that I liked it better this time. "Suzanne", "Romeo Down" and "Summer" sounded really cool and I hope to find those songs on an album later this year. Fortunately the new material again sounds more like in the good old days and not that much like mainstream as the Vision Thing stuff did. The Sisters do not need to attract mainstream fans, because it is not them, attending still concerts after 6 years without any new material (despite the "Under the Gun" single, which was not that good in my opinion!). 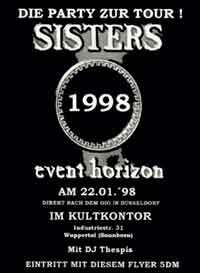 It was my first time seeing the Sisters in such a small venue, because I had just been to Ochtrup and Glauchau before. The sound was good, though Andrew's voice could have been given a bit more sound by the guy on the mixing-desk, as I think. The light show was cool and fortunately it was not too foggy, so you could still see him singing. All in all it was a good show and I hope that the new material will be out later this year and that there will be more shows someday. I just returned home from the Düsseldorf gig. 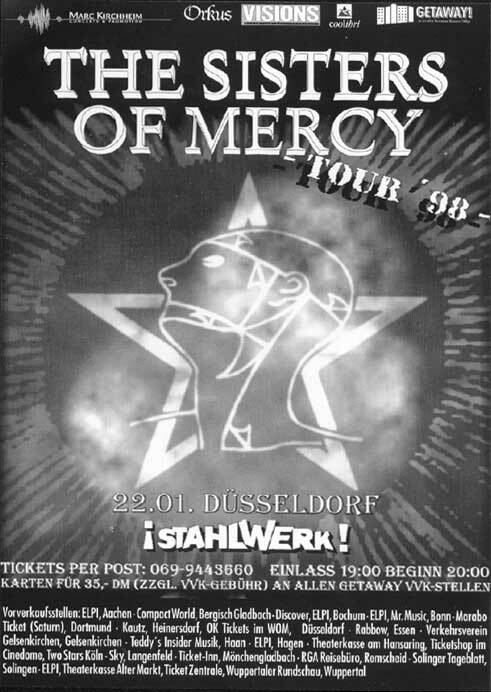 The setlist was exactly the same as the one at Herford. The light show was better because the stage of the Stahlwerk was bigger. On the other hand I must say that I got the impression that the more songs Andrew sung the more he took care of his voice. But everyone has to appreciate this I think considering the fact that it was the third concert in three days and that the Sisters still have to do many more gigs. In my opinion there were too many tickets sold, you hardly had a chance to move. I have already attended lots of gigs but never experienced such a high percentage of CO2 gas. Nevertheless I maintained my position in the second row and experienced a good Sisters gig with an Andrew Eldritch who was again in a very good mood. Excuse me now but I am f****** tired! Tickets scanned (from top) by Sven Togni (togni@pandora.be), Christer Andersson (christe@nada.kth.se), Jochen Upheber (MERCYMAN@t-online.de) and Tobias Dorf (heartwork@wtal.de). Different images colors are caused by different scanning setups. Flyers scanned by Tobias Dorf; thanks are also due to David Hlavacek who sent in that same concert flyer.